Well, the Bee Garden has been a huge success! Much more so than my ultimately unsatisfactory attempts to grow veggies in the same beds. And it’s not just bees that have been attracted to the garden, all sorts of beneficial insects like hover flies, butterflies, wasps, ants and many more previously unobserved bugs have arrived. Many of which have eluded my desperate attempts to photograph them. 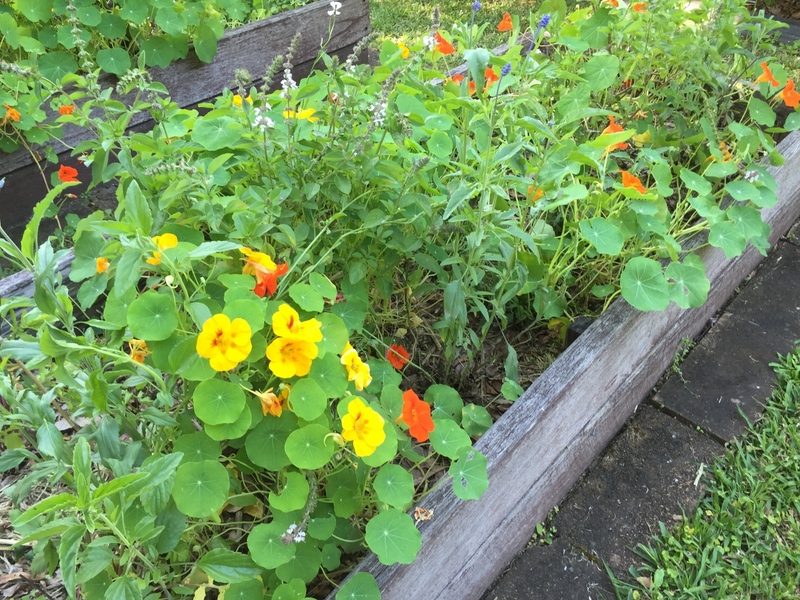 I’ve gained a new respect for nasturtiums and their bee attracting powers, although I now know why it’s often considered a weed, and I’m about to replant with a less rampant variety. Salvia, perennial basil, sweet basil, cosmos, mint and even parsley gone to seed have all performed well, but yarrow was a bit of a disappointment. The flowers are quite attractive, but not a single insect to be seen. I wonder if some yarrow varieties don’t attract bees? Brilliant idea, and hasn’t it just worked? Photos are lovely – the big photo of the yellow/orange plant (I don’t recognise it, Maybe we don’t have it here – could that be the Cat’s Whiskers?) anyway, it reminds me of a Georgia O’Keefe painting. We eat nasturtium leaves in salads! The big yellow flower is a close up of a nasturtium, and I pop the leaves in my salad too. This time around I’ll be eating more as a way of keeping them in check.